We offer affordable loans of £50-£200 to people over 18 who live or work in Lichfield, Burntwood or Cannock and surrounding areas. The money we lend comes from local people who save with us. We’ll email you to ask a simple details for you to join the Credit Union. We’ll arrange your FREE 15-minute money health check at your nearest FCU centre with one of our friendly team to confirm the details and see if we can find you any other money saving opportunities (we’re pretty good at that). Lending is subject to meeting the criteria set out by Fusion Credit Union. You must have access to a bank account and set up a standing order before you get your loan. Interest rates are typically 3% per month. We offer interest rate reductions for people who have paid off one loan and come back for a second. We will agree a regular repayment which we both think you can afford. Unlike many other lenders, there is no penalty for early repayment with Fusion Credit Union. You will need to be a member of Fusion Credit Union. There is a £2 joining fee. 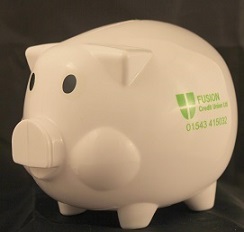 All members of Fusion Credit Union are expected to be savers with us. Minimum savings usually start at £1 per week. Get a free Piggy Bank with every new Junior Saver's Account “Junior Saver” "